Hello everyone in the doodlebug world! I have MISSED YOU!!! 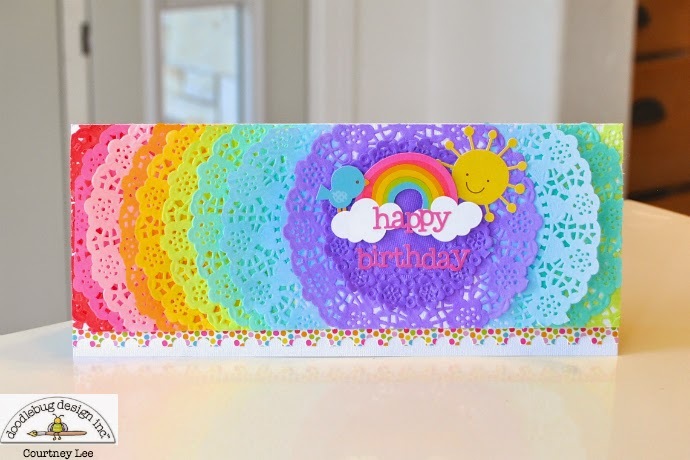 :) It's Courtney Lee from Court's Crafts back here for a guest post (THANKS DOODLEBUG!) using their awesome doilies! I wanted to get a LOT of doilies on this card and really make it the focal point. I grabbed one of every color in the rainbow and cut them in half (eek! Why is cutting them in half so hard to do!?!) Then I started layering them from outside in. I knew I wanted to "right justify" my focal point and I love this color purple. This card fits into a legal sized envelope. It's long and fantastic - perfect for a 3 year old's birthday party that I have coming up. Legal sized cards also allow you to put checks in without having to fold them and you can even use photo corners to hold them in place. Super cute. 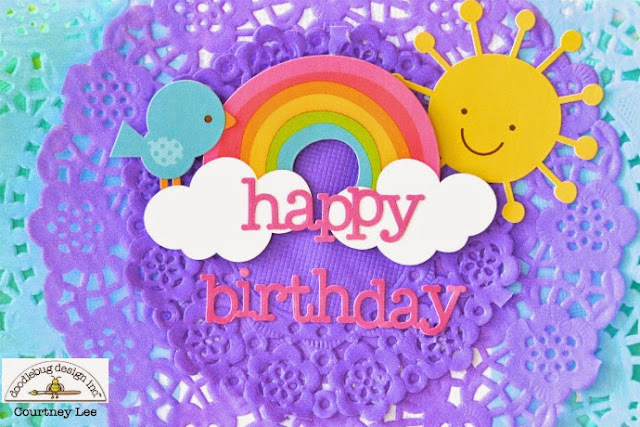 I grabbed some happy birthday stickers (these are pre-done by doodlebug. You can check them out here. They make my life so. much. easier.) I also grabbed the icon stickers from the Springtime Line and went to work on my little scene. I added a lilac mini doily to the center of the other purple one to pull in the focus just a little bit more. Lastly I put a fancy frill underneath and popped the base layer. Thank you SO much for checking out my card today and don't forget to link up to the doily party here so you can win an obscene amount of doilies for yourself! This is just adorable Courtney!!! Thank you Kathy! :) Big hugs! Adorable card Courtney! 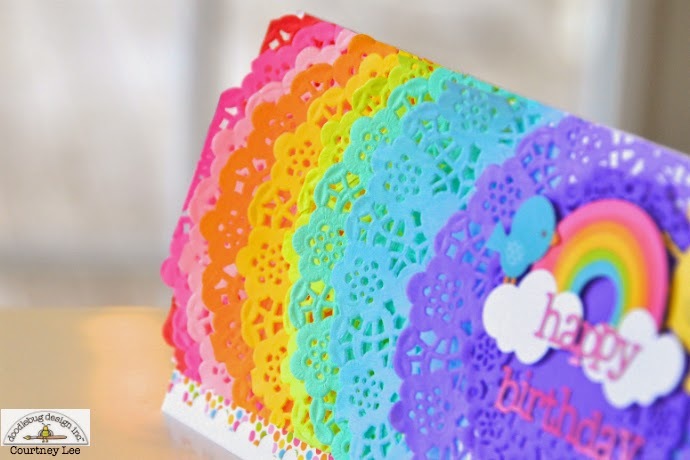 Great use of the doilies -- too cute! Adorable, fun and so colorful!!! Love it! Beautiful and just such a wonderful card - so full of rainbow color and cuteness!! Love it so much!!! That card is gorgeous!!! 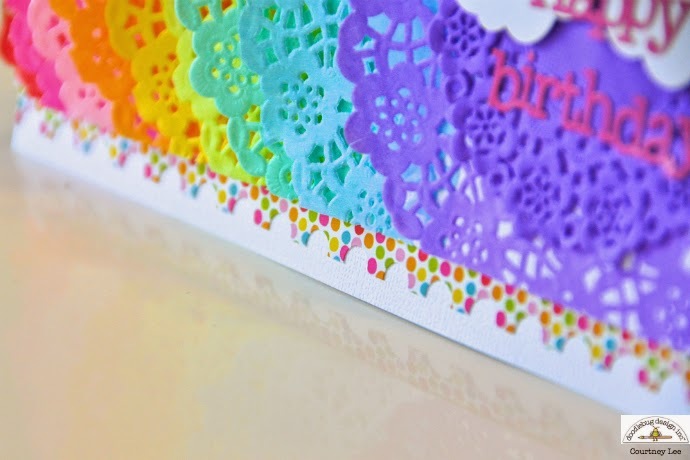 LOve the way you used the doilies!!! That is Soooooo adorable !! I NEED All those doilies !! !